Have you already taken the steps to lay a foundation that is in alignment with the new vision for your life and are desperately seeking the “next-level” to expand further? Are you someone who has woken up to their true divine nature and are looking for ways to step further into their power? Have you said “Yes” to reclaiming the missing components of spiritual practices back into all areas of your life? be a potent influence for the evolution of the collective human consciousness. Note: the insights given in the tarot classes can also be for personal use as well! This course is designed for those who already have an understanding of the basics of tarot and are looking for intermediate to advanced level training that stretches their skills in using one of the world’s most popular divination tools. This course would not be appropriate for those completely new to tarot! In-depth metaphysical and astrological interpretations will be taught in addition to powerful card spreads that I use personally which can help you receive significant amounts of channelled information. Each class is 1.5 hours long: 1 hour of instruction followed by 30 minutes of open Q&A for the material covered. NOTE: individual readings will not be given during Q&A; please book a private session if you are seeking spiritual guidance. All DIVINATION THROUGH TAROT classes occur live at 9am PT. They will be recorded and available to students to reference for all of 2019. When you enroll in the Divination Through Tarot course, you’ll get 8 hours of tarot instruction (a $1200 value), 4 hours of open Q&A (a $600 value), AND…. I’m also including the 5-part online astrology course as a FREE gift plus students get a 20% discount off all services paid for during the 2 month program. The value of this course is over $1900! However, I’m making this unique training available for only $175 -- that’s a saving of over 90%! This course is designed for those who are looking to get a better handle on the nature of their business for the greatest success. It’s also for those looking to take their hobby and position themselves in such a way that stacks the odds in their favor for financial independence. If you own a business/practice or thinking of owning one, then this course is for you! We’ll go in depth to understand how to interpret a business’ natal chart with the knowledge that what we create has a life, a consciousness, a soul of its own. As we learn about the houses, planets, manifestation cycles and more (through a business lense), we’ll be able to create more consciously to achieve greater impact. We are the creators of the New Earth so let’s do so purposefully! All THE ASTROLOGICAL SOUL OF YOUR BUSINESS classes occur live at 11am PT. They will be recorded and available to students to reference for ALL of 2019. When you enroll in The Astrological Soul Of Your Business course, you’ll get 4 hours of business astrology instruction (a $600 value), 4 hours of open Q&A (a $600 value), AND…. The value of this course is over $1300! But, I’m making this unique training available for only $175 -- that’s a saving of over 80%! When you enroll in the Divination Through Tarot class, you’ll get 12 hours of Live, online class time (a $1800 value) for only $175 (a savings of 90%). When you join The Astrological Soul Of Your Business class, you’ll get 8 hours of Live, online class time (a $1200 value) for only $175 (a savings of 85%). As an added BONUS I’m also including access to my 5 hour online astrology course for students of either course (valued at $125). PLUS, students get a 20% discount off all services paid for during the 2 month program. Note: The appointment itself doesn’t have to happen within the 2 month time period however, it must occur by September 30, 2019. This discount is non-transferable. A great Call has gone out to many to expand their work and their reach to support the collective ascension journey. But, the newly Called are getting VERY little time to shift into their new, bigger roles. Gone are the days of it taking years to open up one’s clair abilities or communicate with the higher realms. Now it’s months, weeks, or even days! Others are already adept but they have gone as far as they can with the teachers currently available. The students are surpassing the teachers! What is needed now is an advanced, multifaceted infusion of information and techniques to make a bigger impact. I have designed the Lightworker Incubator as a place where a small group of lightworkers can work with me in a semi-private setting to accelerate their ascension practice and start shifting into a more prominent position in spiritual leadership in their lives. It is a 6 month program wherein the first half features 13 weekly live, online video classes and the second half gives more time to work with the principles and techniques as well as make use of live, online monthly Office Hours for additional support. Monday, July 1st: Orientation class PLUS Bonus 2019 Year Ahead Astrology Forecast reading with the group. Monday, September 30th: BONUS private “Conversations With The Oracle” event with channelled reading, open Q&A, and group Akashic Records healing. All classes are at 6pm PT. They will be recorded and available to students to reference for ALL of 2019. When you join the Lightworker Incubator you’ll get over 13 hours of Live, online class time (a $2000 value), 3 hours of monthly Live, online Office hours (a $450 value), AND a curated community of other changemakers to expand your strategic network. The value of this course is totaled at over $3000! In the expressed interested in making this available to the most amount of people possible while still honoring the energy output, I’m making this incredible 6 month learning experience available for only $500 -- that’s a saving of over 80%, coming out to less than $100 per month! NOTE: There is no additional discount on this course even if you are taking any of the other courses. The Lightworker Incubator requires an “application”—essentially a set of questions that I send you to answer. After reviewing the answers, I then go into council with Spirit to determine whether or not to allow entry. Regardless of a “yes” or “no” on the application, the channelled messages I receive on your behalf will be emailed to you with your notification. You can submit an application whether you’ve applied before or not (or got accepted or not) since each Incubator group is created in the Spirit from the specific souls being called. Part of the intention for this course is to be a connector—literally—with your soul family. CURRENT STUDENTS: Contact me for a special rate if you wish to retake this course. Enrollment for all courses is available through June 15, 2019. Full payment is due by June 15, 2019 in order to secure your place. Remember -- all classes will be live recorded and available to re-watch through the end of 2019. Send an email to info@innersunalchemy.com and let me know which class(es) you’re interested in taking. 1) Is there a payment plan? No, payment must be made by the deadline: March 31st for the exclusive subscriber pricing and June 15th for the open enrollment period. You can make partial payments in whatever increments are comfortable for you however, the full amount must be in by the deadline. 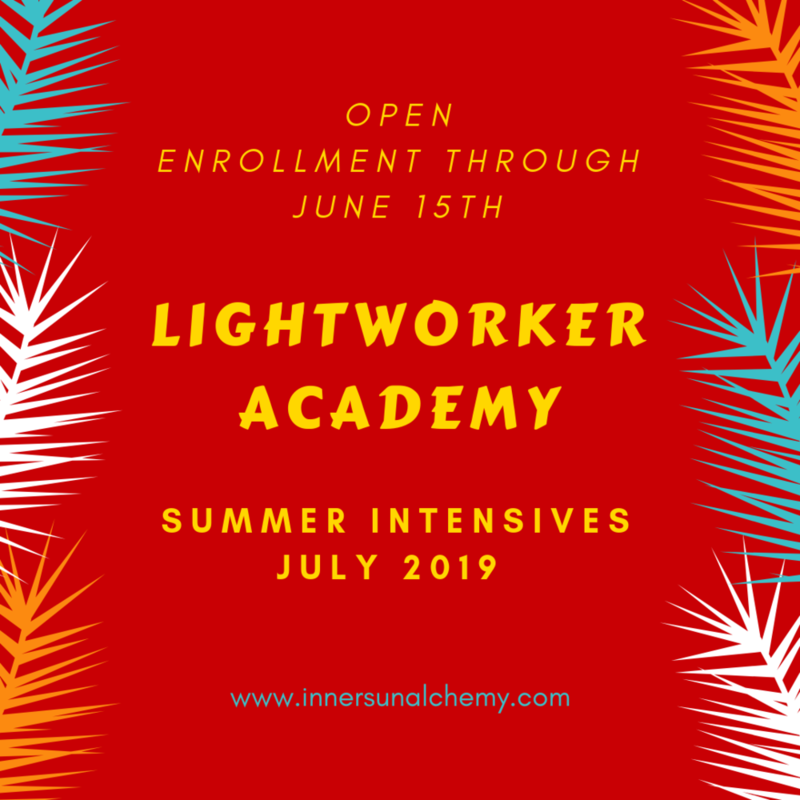 Refunds are available until August 31st (for the Lightworker Incubator) and July 5th (for the other courses). No refunds are given after those dates. 3) What if I can’t make it to the live classes, can I still join? Yes, you may still join because the classes will all be recorded live and be available for viewing for the remainder of 2019. Of course, it’d be ideal for you to be present but, it is not a requirement. 4) What materials will I need to purchase? The Divination Through Tarot course will be focused on interpreting the Thoth deck so you’ll have to purchase that one by the time class starts. The Lightworker Incubator will require specific crystals; the list will be given in the acceptance letter. 5) Is this open to everyone? Yes, all courses are open to everyone however, they are NOT intended for beginners as they are intermediate to advanced level—with the exception of the Business one (beginners are ok). An application submission is required for the Lightworker Incubator and admission to the Incubator is granted based on what comes through in Spirit council; acceptance is not guaranteed.